The Borghese Fountain in Basin was hand-sculpted, with influences from 17th-century Spanish nobility in mind. This mid-sized fountain showcases a bowl raised above a 32-inch wide circular basin with water gently pouring down to create a tranquil garden environment. The Borghese Fountain is 32 inches tall, 34.5 inches wide, 41.5 inches long, and weighs 490 pounds. All Campania International pieces are stained to order. This process takes 10-14 business days to complete and to prepare for safe shipment. 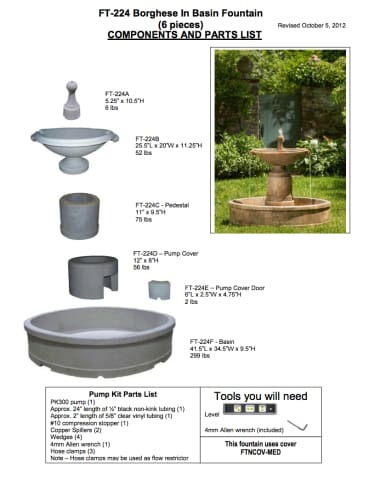 Order the Campania International Borghese in Basin Fountain with free curbside delivery to your home from TheGardenGates.com today.